These days, there really is an app for almost anything—even things you may never have thought of. Want to connect two previously unlinked web services? An app can help. Want to link two previously unconnected devices? Yup, there’s an app for that, too. Read on for information on five of my favorite unexpectedly useful apps. 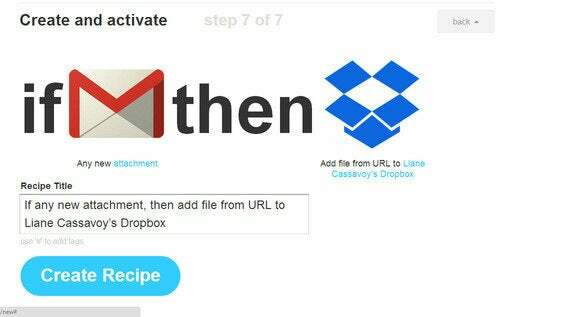 IFTTT links to various web and mobile services, which you can use as the building blocks of the recipes you create. IFTTT has long been one of my favorite apps. This free tool, which works on the web and on Android and iOS devices, lets you create recipes that result in automatic actions online. Don’t worry: it’s far less confusing than it sounds. IFTTT stands for “If this then that”—when one thing happens, IFTT lets you create an automatic reaction. You can, for example, create a recipe that allows you to receive a text message whenever a photo of you is posted to Facebook. Or one that sends an iOS notification if the forecast calls for rain. Or one that automatically turns on your ringtone in the morning. The possibilities are almost endless, and IFTTT provides a collection of public recipes you can adapt for your own needs, so you don’t have to spend too much time thinking over all of those possibilities yourself. Once you install PushBullet's browser extension, you can share items from your computer with a right-click of your mouse. Pushbullet works hand-in-hand with IFTTT, as you can create IFTTT recipes based on Pushbullet’s actions. But even without IFTTT, Pushbullet is pretty darn useful. This free tool is available as an app for Android, iOS, Chrome, Firefox, and Windows that lets you share content between devices with a simple click. On the desktop or a mobile device, you can use PushBullet’s simple, email-like interface to share a picture, file, link, list, or location from or to your phone or computer. And if you have the browser extension installed, sharing an item from your desktop is even easier, as you can add a PushBullet option to your right-click menu. Focus@will plays soothing classical tunes and displays relaxing images—but looking at the pretty pictures won't help you get any work done! I have to admit that I was very skeptical about focus@will. This web service and mobile app (for Android and iOS devices) claims to help boost your attention span—as much as 400 percent—while you’re working. It does this by supplying a stream of soothing music perfectly timed (about 60 beats per minute) to drown out background distractions but without becoming a distraction itself. I can’t say whether focus@will really did improve my concentration by 400 percent, but I did find it easier to get work done while classical music spilled from my speakers. A free account is limited to 60 minutes of playback, while a Pro account ($5 per month) eliminates that restriction and lets you select various tunes from focus@will’s library. Mailtracker shows you when your messages have been read, how many views they've had, and how long those views lasted. Email is both incredibly useful and incredibly frustrating. You can spend tons of time composing the perfect message, but then you send it off into cyberspace with no idea when—or if—it will get read. Enter Mailtracker. This free iOS app works with your iPhone’s built-in email client and notifies you when someone has read the message you’ve sent. It does so without requesting a read receipt from the recipient—something that can turn off many people—and supplies additional info, such as how long they looked at the message. Mailtracker isn’t perfect, as it stumbled when I had multiple email accounts installed on my phone, and it only works on your iOS device. But it can be very useful at times. Full uses a red, yellow, and green color scheme so you can easily track the progress you're making toward your goals. Setting goals is easy. Meeting them—and tracking your progress along the way—is hard. But Full can help. This 99 cent iOS app lets you create monthly goals, both personal and professional, and set a total for the number of times you’d like to achieve them. Want to read three books? Meet with five new contacts? Run 50 miles? Add it to Full. Every time you accomplish one of the goals, you track your progress with a swipe. When you’ve reached the monthly goal, Full rewards you with a message of congratulations. Full features a neatly organized interface, with colors (red, yellow and green) that tell you how you’re progressing at a quick glance. And while Full lacks a detailed memo field for tracking information about your goals, it does allow you to look back at previous months to see where things stood at a certain point in time.